Our final trip of the season was a relaxing 10 days in the beautiful Aune-Osborn campground bordering the waterway of the Saint Mary’s River. We had the wonderful experience of seeing different great lakes freights passing by numerous times a day and even at night. With the weather being that of typical Michigan fall, rainy, windy, cool, we did manage to get a few activities in. We took a drive over to Newberry and visited Oswald’s Bear Ranch, we also had the pleasure of doing a dinner cruise through the Soo Locks, we got to see and experience how the locks worked, a lot faster then I would have thought, we also got to see an eagle perched on a rock in the middle of the river. The dinner cruise itself would normally take about 2 hours but ours ended up being over 3 hours due to a technical problem getting thru the locks on the Canadian side, they had put the train tracks down with the understanding that no other tours were coming thru, so we had to do a turn around and ended up going thru the American locks instead. We looked at it as an added bonus to our cruise. The staff was fantastic and the food and dessert were amazing. Highly recommend doing the dinner cruise! From there we drove over to Munising to pick up pasties and fresh whitefish to bring back home. We had visitors during our stay, our son Aaron and his friend Joe came on the first Saturday we were there, the ONLY nice day we had so we celebrated with grilling steaks and drinking some beer. On Tuesday some other friends came to visit for the day so we did a bit of coffee drinking and shopping downtown. Then on Wednesday and Thursday we had yet another set of friends that came and stayed at the campground with us on their way to Minnesota. Was so nice having company. 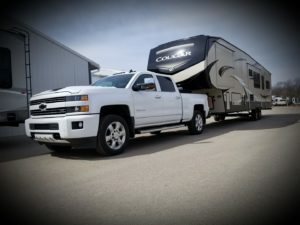 The campground itself is very nice, quiet and on such a great location, just outside of town, about 10 minute drive from the casino and another 10 minute drive to your big box stores and fast food. 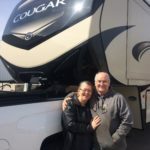 This was the longest time we had spent in our 5th wheel so that was a sheer joy, adapting to eating, showering, cleaning, doing dishes, watching TV and sleeping, it didn’t take long to get the hang of everything and we enjoyed every minute of it.